About Us | Subsurface, Inc.
Having grown up in and around the earthmoving business, we have removed and replaced countless numbers of drainage structures, often wondering why there wasn't a better less expensive way to solve pipe problems. Like an iceberg, what lies beneath the surface that you do not see is much greater than what you see on the surface. With our extensive "open cut" background we knew we were on our way to finding a better, less expensive way to rehabilitate the existing structures without the cost and inconvenience. Trenchless technology would prove to be the answer we were looking for! With more than 80 years of experience in both traditional construction techniques and modern Trenchless lining/repair, Subsurface, Inc. brings a unique and valuable level of ability to complex infrastructure problems. Our customers benefit by getting the best value in each and every application. Doing what is best for the customer, not what is best for the contractor is the way we approach every situation. 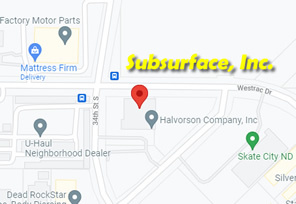 *Subsurface, Inc. is a drainage structure repair and maintenance company based out of Moorhead, Minnesota and Sioux Falls, South Dakota, servicing locations throughout the upper Midwest, central Plains and locations around the United States. Subsurface, Inc. utilizes the most current and up to date trenchless technologies for cleaning culverts and renewing the life of these structures using HDPE slip liners, polyurethane grouts, CIPP (cured in place pipe), polyurethane spray on coatings, RCP joint sealing techniques, internal tie rods and various other products on rail road and highway infrastructure. Subsurface, Inc. performs mainline sewer relining with CIPP, lateral sewer relining, lateral reinstatement with robotic cutters, mainline and lateral televising and cleaning. Subsurface also performs manhole and lift station rehabilitation with Sprayroq products; Spraywall, a structural re-build product and Sprayshield, a corrosion barrier. Subsurface also performs fiberglass and carbon fiber fabric rehab utilizing epoxy, silicate, and polyurethane resins, and railroad ballast stabilization, embankment void filling and stabilization, soil stabilization, water stopping/proofing. Subsurface is also the exclusive reseller and distributor of the IVAC cleaning and materials movement system.